Any season of the year, but especially in the fall, the San Juan Scenic Byway circling much of southwestern Colorado amazes visitors with natural beauty, remains of ancient civilizations, Western history and outdoor recreation. In four parts I’ll share an overview of the route first published in a suburban Denver lifestyle magazine, Buzz in the ‘burb. Like curly ribbon around a festively wrapped gift the San Juan Skyway circles spectacular southwestern Colorado. 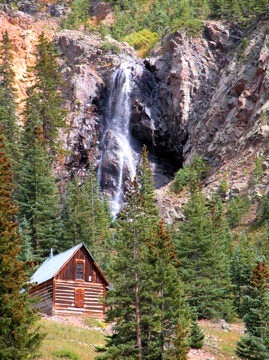 Plunging waterfalls, rumbling rivers, jagged mountain peaks, hot springs, deserted mining camps, rich western heritage, trendy resorts, and ancient cliff dwellings dot the map along the 236-mile loop designated an All American Road and Scenic Byway. Weaving over five mountain passes, the paved two-lane route links two National Forests, a National Park, major communities and remote ghost towns. In theory one can drive the Skyway in six hours. While the windshield-framed vistas would still be stunning I can’t imagine making the drive non-stop, missing the many opportunities for exploration, recreation and a deep breathe of fresh alpine air. Two or three days provides a more realistic time frame while the leisure traveler with a week to spare can easily fill the days and still leave with a to-do list for the next visit. Whether we complete the entire loop or drive just a segment we always vow to return – with more time. 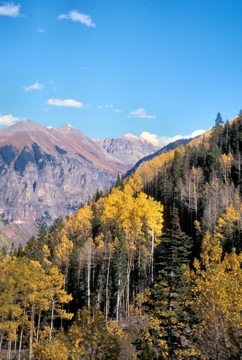 A September visit promises the added attraction of golden aspen groves. The view of Mt. Sneffels from Dallas Divide is a classic Colorado autumn photograph.